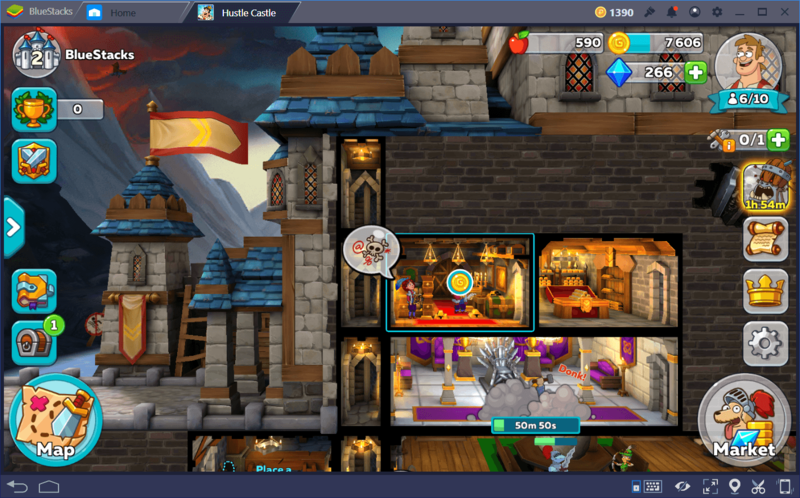 Hustle Castle is the new game by Studio Nord, released past November for Android and iOS, which is also available on our awesome Android Gaming Platform, BlueStacks. By the way, even though the game looks pretty good on most devices, the graphical fidelity, crisp colors, and smooth animations of the game on PC cannot be beaten. We can’t stress enough how much better the game plays on a bigger screen, with controls optimized for mouse and keyboard. Anyway, let’s get right to it, and talk about people. 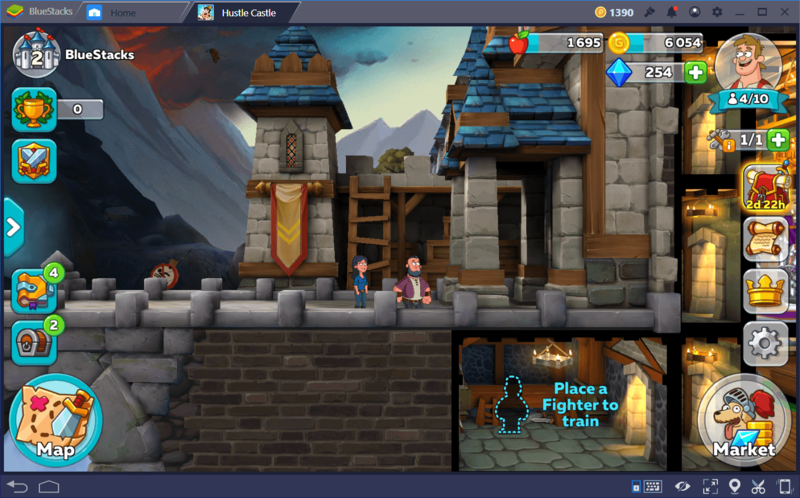 By people, we mean the dwellers that populate your castle in this game, which look strikingly similar to characters from Family Guy, or any other Seth Macfarlane animated show, for that matter. Other than their looks, dwellers have so much more to offer your base if managed properly. In this sense, your success in Hustle Castle will depend, in great part, on your staff micromanagement skills, through which you will be able to achieve the full potential of all your dwellers. Nevertheless, managing your personnel can be a bit confusing, especially if you’re just beginning and are randomly assigning roles and responsibilities to your dwellers all willy-nilly. Luckily, this is where this article comes in. 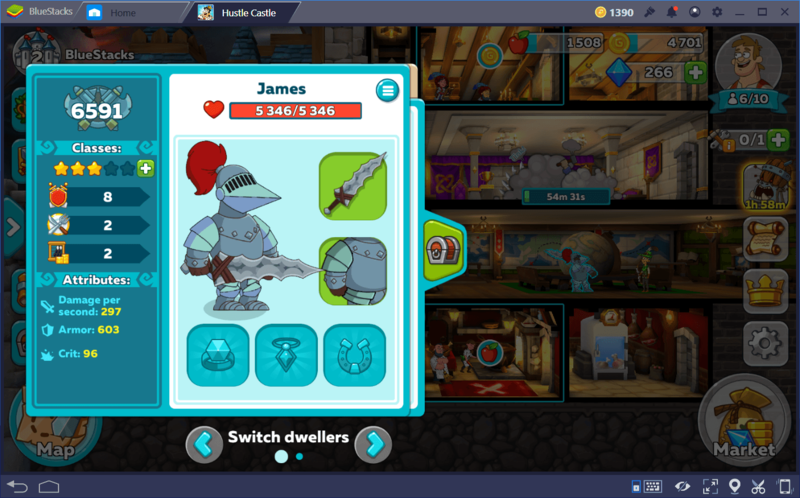 In this guide, we will briefly explain the ins and outs of the dweller system, as well as how to properly use and train your staff to the fullest extent of their abilities. First off, something that is not directly related to the topic at hand, but can still affect the rate at which your dwellers produce resources, is the happiness meter. If you take a look at the upper right corner, you can find your portrait. By clicking on this portrait, you will open the happiness screen, which will allow you to discover the current happiness of your dwellers and the bonuses that you are receiving from it. 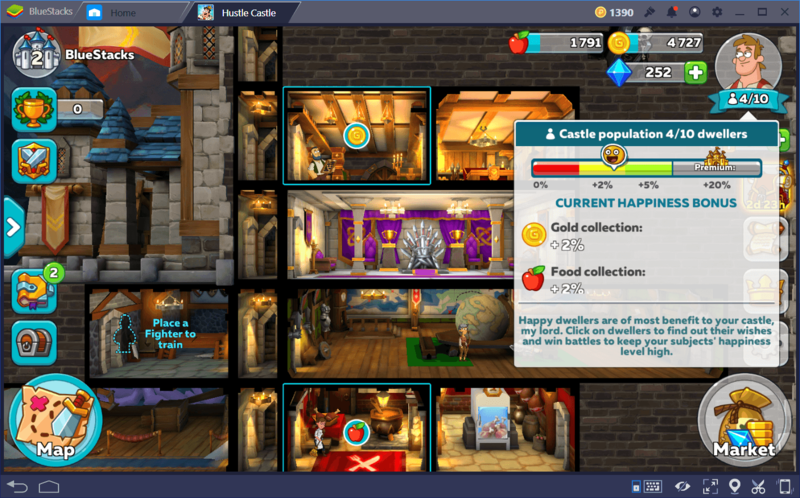 In the screenshot above, you can see that our dwellers are currently enjoying a 2% bonus to their food and gold production from their happiness, which isn’t much. However, if we increase their happiness to the maximum level, they will receive a more formidable 5% bonus to the aforementioned production levels. Nevertheless, keeping happiness up isn’t very easy at the beginning since you won’t have many opportunities to increase it. As your dwellers make their lives within your castle, they will experience a wide variety of emotions and desires, which you can see in the form of thought and text bubbles over their heads. By clicking on these bubbles, you can receive happiness points which float towards your portrait and add towards the happiness of your dwellers. Furthermore, winning battles on the world map in PvP matches also adds to your happiness. Giving birth to a baby in your base will also add a large amount of happiness to your castle. When the baby is ready to mature (which is represented by a cake icon), you may also click on it to receive a happiness boost. Sadly, the largest production boost, which is a 20% increase in food and gold production, is locked behind a premium paywall; you need to purchase a premium subscription to enjoy this sizeable bonus. All dwellers are divided into 5 categories, represented by the number of stars; from 1 to 5 stars. 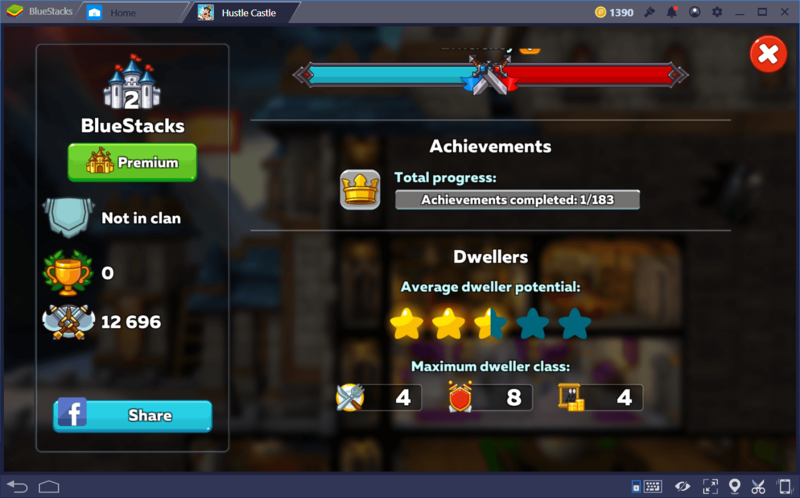 As you may have guessed, these stars represent the dweller’s level of quality, with 1-star being the worst, and 5-star dwellers being the best of the best in terms of attributes. 5-star dwellers are understandably harder to find so, in most cases, your castle will only have a few of these, if any, at any given time. You can consult your character’s category and attributes at any time by clicking on them. In the beginning, you’ll only have a few 1-3 star dwellers. You can find new dwellers at the beginning of the game by beating certain stages on the map. You can know which stages unlock characters since there is always a cage holding some villagers inside, which will join your castle after you defeat the enemies. Later on, you will be able to breed your dwellers via the use of the Living Room. Treasury: Increase gold production when assigned to the Treasury. Can be increased by training the dweller in the Mint room. Cook: Increases food production when working in the Dining Hall. Can be upgraded by training the dweller in the Kitchen room. Alchemy: Increases the production of Mana. Can be upgraded by training the character in the Lab. Fighter: Increase the dweller’s proficiency in combat. Can be increased by training them in the Fighter Training Room. 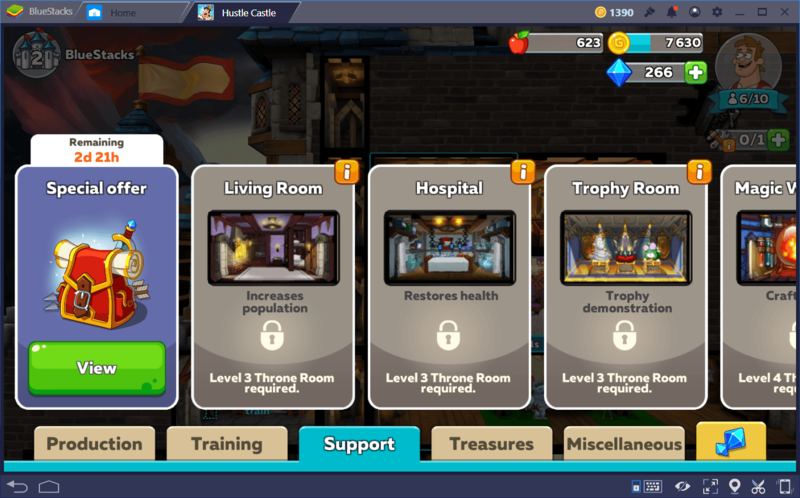 You can unlock the Lab, Kitchen, and Mint fairly yearly into the game, by upgrading your Throne room. Damage-per-Second: Represents how much damage, on average, your character does per second in battle. Armor: Reduces physical damage taken. Exclusive to those who are equipped for battle. Production: Represents how much food or gold your character produces per hour. 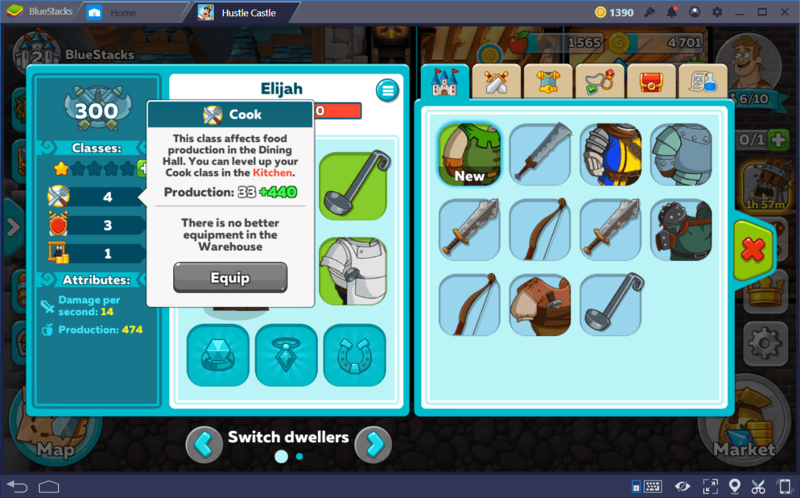 Affected directly by their gear, as well as their cook or treasurer class levels. Dodge: The proficiency of your character at evading attacks in battle. Crit: Represents the probability of delivering double damage to the enemy on each hit. Once you unlock the Living Room, you will be able to assign a male and female dweller to the room to get them dating. Once the process begins, you will eventually end up with a pregnant dweller, who will give birth after a few hours have passed. Once the baby is born, you will receive a massive boost to happiness, as well as a new dweller in your midst. However, before becoming useful, the child first needs to grow into an adult, which takes about 6 hours. These new characters function the same as any other dweller once they grow up, and will perform adequately as long as you train and equip them accordingly. While dwellers of higher categories will have better attributes from the start, this doesn’t necessarily imply that your starter characters won’t be able to pull their own weight. Make sure to train them properly in the skills you want them to focus on, and equip them appropriately for their role. Before long, you’ll see that you’ll have a cast of amazing characters doing their best both on and off the battlefield.